The United States Educational Foundation in Pakistan (USEFP) is now accepting applications for the fully funded 2019-2020 USEFP Fulbright Scholarship Program in the United States of America. 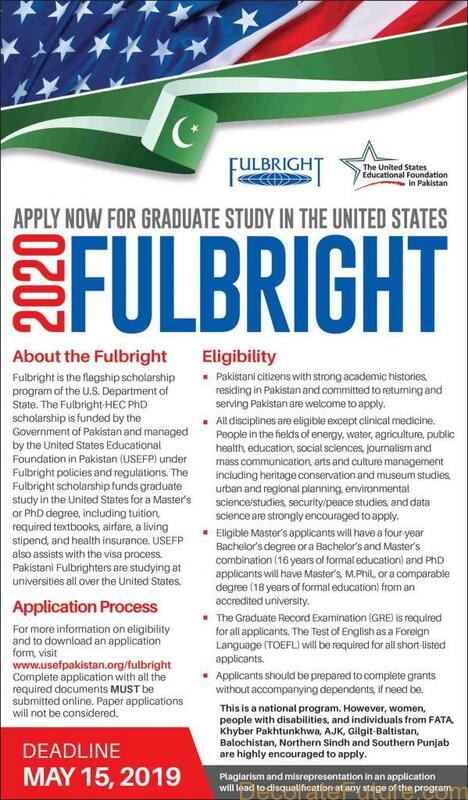 The Fulbright Degree Program Applications are open for Pakistani Students and the Fulbright Scholarship Program is offered every year in February and Fulbright Scholarship applications are received till March-May. The Fulbright Masters and Ph.D. 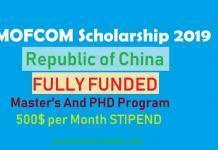 Program funds graduate study in the United States for a Master’s or Ph.D. degree. Funded by the United States Agency for International Development (USAID). These grants cover everything including tuition fee, required textbooks, airfare, a living stipend, and health insurance. USEFP also helps with the visa process. The Fulbright Scholarship Program 2020 is an amazing chance for needy students to study in the United States of America. The USEFP Fulbright Degree Program grant is not only for Pakistan but for 150 countries around the world. For both the Masters and Ph.D. programs, all academic disciplines are eligible, except clinical medicine. For the Masters degree program, eligible candidates will have either a four-year Bachelor’s degree or a Bachelor’s and Master’s combination totaling 16 years of formal education from an accredited university. Recent graduates are strongly encouraged to apply, except for MBA applicants, who require 3 years of work experience. For the PhD degree program, eligible applicants will have a Master’s, M.Phil or comparable degree (a minimum of 18 years of formal education) from an accredited university. It is highly desirable that candidates have work experience in teaching, research, or the public sector in Pakistan. 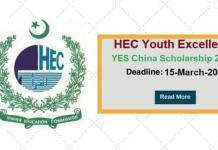 Pakistani citizens, residing and working in Pakistan, with strong academic histories in all disciplines except clinical medicine, are welcome to apply. The Graduate Record Examination (GRE) is required for all applicants. Minimum scores of 138 in the verbal and 136 in the quantitative sections are required. Applicants must also possess a high level of fluency in spoken and written English. 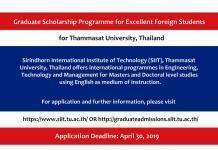 Short-listed applicants will be required to bring proof of TOEFL registration with them to the interview. Scanned transcripts, including an explanation of the grading scale of the university issuing the degree should be uploaded. 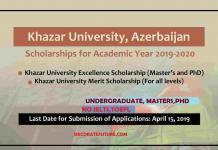 Please note that HEC-attested documents are preferable with the application but degree and transcripts attested by the issuing authority will be accepted at the time of application.